I have realised that I have been keeping Jack Brabham in that corner of the mind dedicated to legendary drivers that are no longer with us. But Jack is very much alive and well, considering his age. Class of '26, he has been racing in Formula One all the way across ‘The Killer Years’ from 1955 to 1970. He was 44 by then but still as competitive and ruthless as he had ever been. Jochen Rindt, sadly posthumous World Champion in 1970, would have to battle him to the last lap twice in that championship. 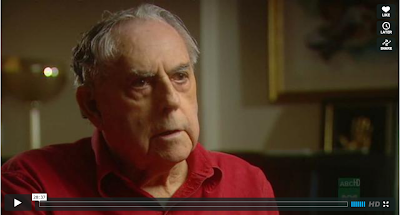 Click HERE to be linked to a nice documentary about the man Jack Brabham. The internet is full of stories about Jack, including his undefeated record of being in ‘66 the one and only man that managed to win the title in a car bearing his own name, so here at CCT we decided to tell the obscure story of the Jaguar Mark I related to this amazing driver - a story we were told in a London pub. Back in the sixties K.M. was one of the many young lads working as a mechanic in the flourishing British automobile market. Courtyards and small garages all over the island used to be the place where small teams of friends were having a shot at building race cars one way or another. K was in the second hand car trade, with a healthy network of mates all over the place and managed to buy for scraps a Jaguar MkI with a friend. The car didn't have external mods but was race prepped by Jack Brabham's workshop. I would love to have more information about Jack's involvement in the car but by the time K managed to get his hands on it it was nothing more than an old racer and that only. We all know that ‘MkI’ is a retrospective name introduced to name the older version of the MkII in 1959. 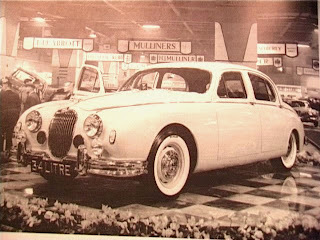 This "baby" Jag, presented in 1955 and produced from '57 to '59 was a well trimmed entry level sedan offered in a 2.4 and 3.4 straight 6. The model was extensively raced by the likes of Sir Stirling Moss and Mike Hawthorne and would go on to win two Australian Touring Car Championships. K got his 2.4 in 1966 and by that time it wasn't any more than an outdated banger. With his friends he decided to update the rear fenders, removing the spats and reshaping the wings in fibreglass. He became friends with the young heir of a famous banker who had just stolen a considerable sum from his parents and was pretty much on the run looking for his summer of love. They fitted a roof rack and filled with the sixties spirit they set off for Morocco with K's savings and his friend's loot. The plan was to stay over there as long as possible and I can only imagine their faces while on top of the deck of that ferry they were looking at England getting smaller and smaller wave after wave. The poor Jag must have looked pretty scruffy on French highways with a lot of junk on the roof and two long haired jacks puffing cigarettes and whatnots. "...We were going our own way pretty relaxed even if we knew that the car was capable of great things, we already had fun with it back home and we were honestly in ‘trip mode’, but when that guy with a brand new 911 passed us and cut our lane with arrogance I sort of lost my temper. I stuck to his bumper and he started to push hard trying to lose us but it was simply no match, even with the car on full load. I let him get out all he had and then left him in the dust. He had a girl with him in the car, I guess she must have lost a bit of respect for him that day." The 2.4 had an unusual setup with a rear track 114mm narrower than the front. Some thought this was a design choice giving the car its unique look and allowing the stylish rear spats but it seems more likely that Salisbury didn't have a suitable rear axle available. One way or another, the narrower rear track made the car exceptionally stable at high speed. And K's car must have tested this many times along the way. After crossing Franco's Spain our heroes landed in Morocco where they enjoyed the best sort of holiday, the one that doesn't have a definite end. But the end eventually came one day with the realisation that there weren’t even funds enough to get back. The only solution to get money fast and on the way home was smuggling. They invested most of the money left in the best hashish they could find and hatched a plan to get it into Franco's Spain. Tinkering with the fibreglass rear wings in the Tunisian desert didn't seem like a good idea, so they resolved to cut open the front wings and stuffed them with the precious high. They then used all their craft to seal everything up. Money was getting seriously short now and the car "hotter and hotter...by then the transmission became rattly, and I mean, really rattly". I can picture the scene. The ferry from Nador is slowly approaching the dock of Almeria after a night haul. Our lads have spent the last night taking all life had to give before the tricky trip. They don't even know what would have happened to them if caught with a couple of kilos of hashish in Franco's land. They really have no idea and probably never want to know, but know that it would be bad, very bad. But anyway, the plan was not to get caught. Sailors and harbour dockers have just finished securing the ferry to land. The hatch starts to open, revealing the usual dusty first row of lorries that have just been travelling too much. The first row rolls away, the second starts its engines with the usual mechanical growl and so forth. The customs officers hide their chins in ordinance jackets after each cigarette puff. It's bloody cold at 5am in Almeria's harbour, the sun only a faraway shimmer in the east. Then they turn their heads with a jump. Something foreign has stirred in the bowels of the ferry. A different, deeper, rattlier noise. It's our Jag. Thanks to Brabham's service, louder and more savage. The officers weren't ready for what they saw - two bloody hippies in a rattling old Jag. Usually they saw these sorts of rats going the other way, what the hell were these guys up to? K drives slowly between the lorries and buzzes towards the empty cars lane. The gate is closed, one officer holds a cup with two hands behind a glazed door, the other holds his collar shut while a wet cigarette looks at the ground from his deep, unshaven face. He approaches the car only to find a sleeping guy without a steering wheel in front of him. K politely waves the documents from the other window. The officer sighs at the sky and hates the Queen a bit more, he just can not be arsed this morning. K's mate needs to sneeze, but he has decided to be asleep and is going to stick to that plan. The officer steps back to look at the registration plate and K reaches for the packet of cigarettes, only three left. Now two. The officer walks around the car and grabs the documents, mumbling. The official spits out the fag and steps back from the car. K takes another puff from his cigarette. Time stops. The other officer, no longer behind the glazed door, has kicked it open and shouts something that makes the smoker with the deep face look from K to the sleeping figure on the passenger seat, throw the documents inside the car and bang his hand twice on the car roof, just above K. The gate opens and K brushes away the cigarette ash that has fallen into his lap, again. The car starts to roll slowly but just as it’s halfway through the gate, the engine stalls. K raises his eyes to the rear view mirror, his friend opens his wide. In the reflection the deep faced smoker gets a smoking hot mug from his colleague. They laugh and look the other way. K restarts the engine and slowly joins the lonely traffic on Calle de Nicolás Salmerón, becoming just any other car. From the passenger seat a voice says “shall we eat something?" "Let's get out this town first". They eventually managed to sell the car to someone on the coast. I never completely understood if the hash was included in this transaction or if it was sold separately. All I know is that if somewhere in the south of Spain you find a 2.4 with fiberglass rear wings, then you could do worse than take a look at the front wings too. You might be in front of a Jag tuned up by Jack Brabham. NB - Unfortunately there is no photographic record of the Jag and that amazing trip, all the ones you see here have been found randomly online and have been modified in order to suit the story.